Lee Hutchings has been the Assistant Pastor for Church Planting since March 2018, having been called to start a new PCA church in the Greater Canton area. He and his wife Diane are proud parents of one son, Harper, age five. Lee is a native of Akron, OH and attended Cuyahoga Valley Christian Academy where he met his wife Diane. 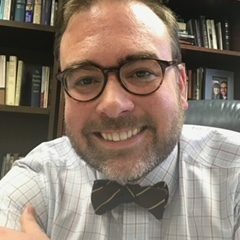 After attending Concordia University in St. Paul, Minnesota and graduating from the University of Akron with a Bachelor’s degree in English Literature, Lee received his Master of Divinity from Reformed Theological Seminary in Jackson, Mississippi in 2012. Lee was ordained a Teaching Elder in the Presbytery of Mississippi Valley while serving as Pastor of Discipleship and Congregational Life at Highlands Presbyterian Church in Ridgeland, Mississippi before being called to Grace. Lee has also served as an Adjunct Professor in the Bible Department at Belhaven University in Jackson.